Thank-you so much for everything you did for us on our wedding day on Friday. Everything went so smoothly and it was an amazing day. Your manner and organisational skills were very much appreciated. AND the food was fabulous -a real credit to you. We both can’t thank you enough for everything you did for us on the big day. You could probably tell we had the time of our lives and a HUGE part of that was down to you and your excellent team. The food was truly delicious and commented on by lots of guests. The service was exceptional and you were just fabulous as the master of ceremony! You were clearly in complete control throughout and we felt so relaxed as a result. You were an absolute pleasure to work with and you managed to create exactly what we were after with the aprons and calling each carver into the kitchen. People were genuinely talking about it for weeks after the wedding! I know that it actually takes a lot of expert co-ordination to get those things right and you did it superbly. We would not hesitate to recommend your services to anyone – you are an asset. I’m so sorry we didn’t get chance to thank you and your team properly at the end of the night but everything seemed like such a whirlwind! 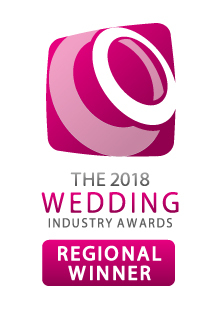 We hope that you got lots of votes for the wedding industry awards as you thoroughly deserve it. We have just come back after a lovely honeymoon in the South of France. We wanted to again say a massive thank you for making our day so special, it truly was the best day of our lives!! Everything went so perfectly and a big thanks to you and Giles for everything you did on the day and before. Everyone is still talking about how fantastic the venue was and I will be singing your praises for the rest of my life! You helped to make our wedding day perfect – thank you to you and the team on the day for all your hard work and professionalism – both on the day and during the planning process. The wedding was exactly what we wanted and how we imagined it would be and we couldn’t have done that without your help and guidance. You went above and beyond what we had expected. Please send our thanks to your team again, we really hope you win the industry award as you deserve it!! We will not hesitate to recommend you in the future. What can we say! Our day was amazing all because of your hard work and dedication to make sure it went off without a hitch! Compliments have come from all guests about how impeccably smooth the day went, how tasty and moorish the food was and our day made the the perfect picture which was crafted by Andrew. Thank you so much to you all, we cannot express how we feel enough. What can we say other than a MASSIVE THANK YOU for all your help yesterday! We had an absolutely amazing day and we heard nothing but praise for everything that you and the Crown team did. The food was perfect and the way you and your team operated was ideal – always available when we had questions but discrete and polite when it suited. We would have no hesitation in recommending you to friends or family, and good luck for the future. Thank you so much for doing an outstanding job at our wedding at Birtsmorton Court on 31st August. The food was absolutely fantastic, it was served and cleared away promptly, presented beautifully and tasted amazing. We’ve received several positive comments from our well-fed guests! We were particularly pleased with the evening food. We expected a few pizzas and sausage rolls to be put on a plate on a table somewhere and were really impressed, and in a strange way proud, to see gorgeous pizzas in cute little pizza boxes and proper sausages in soft floury farmhouse rolls being offered around the garden to our guests. Thanks again, you did a cracking job. I’ve put my vote in for the 2014 Regional Wedding Award, good luck! A huge thank you to you for helping make our wedding day so successful!!!!!!! We cant thank-you enough for the extremely hard work you put in to making our day so amazing! From start to finish you were in complete control of the running of our day and no-one worked as hard as you! You are a true legend! The food was absolutely fantastic and we had so many comments about how much everyone enjoyed the tapas. I am so glad we went for something a bit different from the normal wedding food, the tapas was incredible and I only wish I could have eaten more on the day as with everything going on I just couldn’t manage it! The canapés also went down a treat as did the trio of desserts, cheese and the pizzas in the evening! Again i couldn’t eat one but we took some back to our hotel at the end of the night and enjoyed them whilst we chatted about the incredible day we just had! Ideal end to a perfect day. The bar and waiting staff were also fantastic, working extremely hard and always polite offering excellent service even when everyone was drunk! I understand how annoying and frustrating it can be when everyone around you is drunk but you and your staff were fantastic! I just wanted to write and thank you and all your team at crown catering so much for everything you did for our wedding. The food was absolutely AMAZING! I couldn’t have imagined how good it would taste, how smooth the food service would be and for how helpful everyone from crown was on all 3 of the days. I felt so reassured by your calm and organised manor throughout the day. We had so many comments from our guest about how good the food was which is an amazing achievement to please 120 people! Thank you again for all your hard work- you were fantastic! I’m sorry it has taken me a few days to get back to you to thank you so much for everything you did at Zoe and Nick’s wedding on Saturday. I have only just come down from the cloud – it was truly a perfect day! I have heard from many of our guests how attentive and efficient all the staff were. Although it was all a bit of a blur to me, I was aware that you were there at all times, keeping an eye on everything and making sure everyone had a full glass and that no-one was kept waiting for food or drink. I do remember thinking that I hope you weren’t on your feet all day! You were fantastic and so were all your waiting staff – please pass on my heartfelt thanks to them. And as for the food! It was superb! So many compliments on the beef – I don’t know how, but the chef managed to cook it so that it suited everyone perfectly! I know mine was delicious! The veggies loved their courses and the chicken was remarked on as being really tasty and unusual – there were clean plates all round. Our sincere compliments to the chef! Thank you to you and all the team for your help and advice from the start and for really delivering on the day. We were thrilled with everything and will highly recommend you to anyone who is looking for the highest class caterers with a friendly, efficient and professional approach. We just wish we could do it all again! Very best wishes to you all and especially to you in the coming months. Please don’t overdo it! Thank you so much for not only supplying such wonderful food and service, but for helping our wedding day to run so smoothly. A number of guests commented on how delicious the food was and how well run the whole evening was – so thank you. Nothing was ever too much of a problem – even scouring the venue for a garter that was on Mary’s leg the whole time – sorry Claire!! Thank you for helping to make our wedding the happiest day of our lives. A note to say we could not have been happier with the food and service on our special day. You were discreet yet efficient and the food was commented on by so many guests, some saying the best wedding food ever! Claire you were so friendly and helpful and excellent in our meetings. p.s. Mum & I would like to have the food all over again!! Thank you so much for helping Rose and Jake organise the reception for their wedding last week. The food was wonderful, we have had such good feedback from all the guests, it went so well to make their wedding day very special. I just want to say a huge thank your team and particularly to Dale for the wonderful day we had on Thursday at Emily and Huw’s wedding. The food and service were superb, so many people commented on how delicious it was and the chef should receive especial compliments for the lamb which was cooked absolutely perfectly, not an easy thing to do with so many to feed! Thank you for all your hard work to make our day so special. Everything was seamless and the food was beautiful – all our guests commented on how nice it was.